Mauritania has many native mammals that face similar fates as the Scimitar Oryx, which is now extinct in the wild. Mauritania, officially known as the Islamic Republic of Mauritania, is located along the western coast of North Africa. It is the eleventh largest country in Africa and to the east and southeast borders is Mali, the Atlantic Ocean to the west, Senegal to the southwest, and Algeria to the northeast, while Morocco and part of the Western Sahara lie to its north. The country’s area coverage is 397,685 square miles with a population of approximately 4.1 million. Nouakchott is the capital as well as the largest city in the country. Mauritania’s wildlife is composed of both fauna (mammals and birds) as well as flora (plants). Several mammals face extinction such as the Scimitar Oryx. Bwlow are some examples in more detail. The Northwest African Cheetah is also known as the Saharan cheetah. Its scientific name is Acinonyx jubatus hecki and is physically different from other cheetahs. It is a smaller with a nearly white short coat with spots that fade from black to light brown along the spine and on the legs. The face has few or no spots on the face and also tear marks often miss. It ranges around the central and Western Sahara and the Sahel in small fragmented populations. These cheetahs are more nocturnal than other cheetahs enabling them conserve water and stay out of the daytime heat. They hunt for food, and their main prey are antelopes such as the addax. The northwest African cheetah was declared endangered species in 2009 mainly due to poaching of the animal for its skin or deliberate killing of these cheetahs as thy attack goats and camels, and resolution of impending conflicts could address this. Poaching of their prey such as gazelles by humans could potentially deprive them of their food, and thus lead to their extinction. Its scientific name is Addax nasomaculatus and is also referred to as the white antelope and the screw horn antelope. It was first described in 1816 by Henry de Blainville as both male and female. The addax is sexually dimorphic as the female is shorter than the males. Furthermore, they do not have a specific habitat as they are nomadic, majorly in search of the grazing fields, and have recorded several habitats in the Sahara. The addax is one of the endangered species due to uncontrolled hunting which has accelerated over the years which can be controlled by fence enclosures and drought. The addra gazelle, or mhorr gazelle, is scientifically known as Gazella dama. It is a species of gazelle found in the Sahara desert and the Sahel with a tan-brown head and neck. Both male and females have medium-length ringed horns curved in an S-shaped fashion. They are the largest type of gazelle with long legs which provide a large surface area to dissipate heat as they are diurnal. The dama gazelle needs more water than other desert animals thus aren’t resistant and perish during drought. Whereas the main reason they are endangered is due to deforestation of trees they feed on and mechanized hunting and as a result, reserves have been constructed so that the animals can live peacefully. Its scientific name is Hippopotamus Amphibious, and it is the third largest mammal after elephants and rhinoceroses. It has a barrel body with short legs and almost flattened 14-inch-long tail. Its head is adapted for submersion with its ears, eyes, and nostrils located high in the skull whereby the nostrils are closed when it submerges in water. They are sexually dimorphic, as males are larger and heavier than females. They are also semi-aquatic as they spend their days in water and nights on land hence are nocturnal animals who live in water, estuaries or lakes in groups of averagely 30 hippos. They are herbivorous animals hence feed on grass and not aquatic plants even though they live in water. Their primary threat is humans as they kill them either for meat, tusks or for destroying crops. 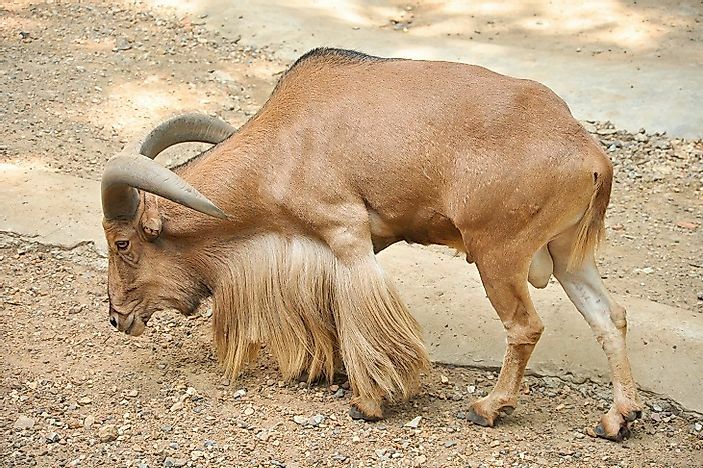 The Barbary sheep is scientifically known as Ammotragus lervia. They are sandy-brown in color and darken with age, with a slightly lighter underbelly and having a dark line running along their backs. There is some shaggy hair on the throat (are more on the males than females) and their horns have a triangular cross-section. Their relatively smooth horns curve outwards, backward, then inwards with a length of 20 inches. They naturally occur in northern Africa and are found in the rocky, arid mountainous areas which help them evade the predators. They are crepuscular as they graze early in the morning and late in the afternoon. Their greatest threat is desertification, poaching, habitat destruction majorly from grazing and drought. Establishment of reserves in the north would be if help in saving the Barbary sheep. Human activities are a major threat to the healthy existence of many mammals in Mauritania. Hunting and poaching has led to massive decrease in their numbers but, global warming is causing desertification and change of habitat that has adverse effects on animals. Some mammals such as the oryx have been hunted to extinction in the wild and can only be found in protected enclosures.